Manager Alex Neil believes Hamilton's 10-2 hammering of Morton will give them huge confidence for the promotion play-offs. Neil's side finished two points behind Scottish Championship winners Dundee, who beat Dumbarton 2-1 on Saturday. 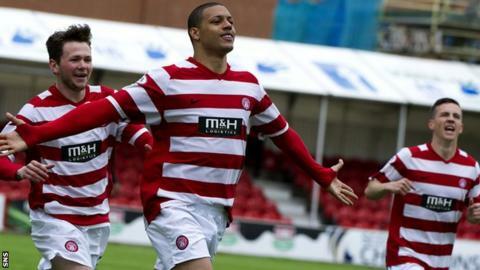 Accies' winning margin meant they would have secured the title on goals scored had Dundee drawn. "We produced an unbelievable display, and if we take that into the play-offs we have nobody to fear," said Neil. "It was incredible. To score 10 goals against any opposition is remarkable and the way the players went about their business just showed the hunger and desire, and how much it meant to them. We're just really, really unfortunate. "To be honest, we hadn't mentioned the goal difference, we just spoke about winning our game, but when the goals go in and they continue to go in, we knew we had to go for it," added Neil. "It only took one goal from Dumbarton, which I think they're unfortunate not to get at the end when it hit the post, and it could all have changed. Credit to all the players, they were magnificent today." Mickael Antoine-Curier scored four against Ton, and Tony Andreu notched a hat-trick. Michael Devlin and Louis Longridge were also on target, while Morton's Stuart Findlay scored an own goal. Hamilton will now play the winner after Queen of the South face Falkirk in the play-offs, for the right to take on the team that finishes 11th in the Premiership. "We know both teams really well and over the course of the season we've got 10 points out of 12 from the two teams, so we've done well. But a play-off's a one-off game, so we've got to make sure we're at it," said Neil.